It’s an unique Giro 2019 spectacle, unique riding in an unique location San Marino (RSM). Italy is synonymous with great cycling join us at the Giro d’Italia in 2019 for your own amazing Italian adventure in the principality of San Marino facing the Mountains to the west and the Adriatic coast to the east. 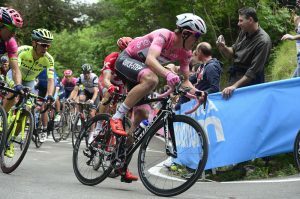 With an exciting variety of 3 contrasting Giro stages on offer, join the action live and enjoy a selection of superb tailored rides to suit all abilities come and experience a Bike Tour with a difference at the Giro d’Italia in May 2019! 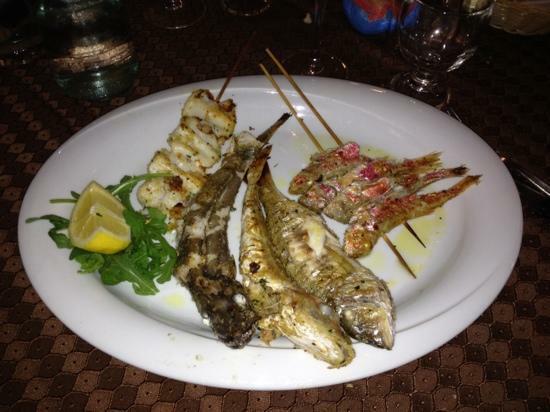 The Giro d’Italia fun does not have to be climbing everyday in the snow capped Dolomites! Our 2019 Giro d’Italia bike tour will be your bike race experience of a lifetime, with our quality model of one perfect location, 3 x live Giro Stages, small group and tailored fully guided rides in the unique style of Practice Bicycle. Whether you are amongst the Italian fans and the final attacks of the stage, up close to the stars on the streets of San Marino or amongst the razzmatazz of the stage start in Ravenna it will be pure Giro d’Italia! If you are a fan of bike racing share the race for Pink at the Giro d’Italia 102nd edition with this exciting memorable life time bike tour in 2019. Are you the ‘discerning’ cyclist wanting to be challenged, be relaxed, be excited or be in admiration, which ever you wish to be the Professional team at Practice Bicycle Tours have it covered! Can’t get enough of cycling in Italy? Come and discover the beauty of the Italian Riviera by bike our Sanremo bike trips are run the whole summer. Why not extend your holiday and turn it into the cycling trip of a lifetime? Tour Type Ride your bike and watch the best races in the world, together with the professionals that live it! Our bike race tours combine fantastic cycling, unique bike race viewing in a relaxed small group. Experience bike racing like you have never before! Activity Level Because our Bike Race Tours are always based at a single location, we can tailor the ride routes to meet your riding requirements and abilities. Available Packages All our prices are AUD $ per person based on twin share accommodation. If you require a single room, a single room surcharge will apply. Includes 3* Hotel Accommodation and exclusive Italian Feasts. Our Giro Non Cycling tour package is designed so that you can experience all the fantastic race viewing and unique sight-seeing on offer. 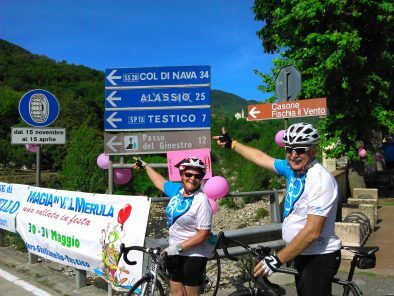 In fact, you will enjoy all the same benefits as your wife/husband/partner from the Giro d’Italia Bike Tour Package only your choice is to enjoy the sights, sounds and activities of the tour from the comfort of the support vehicle. 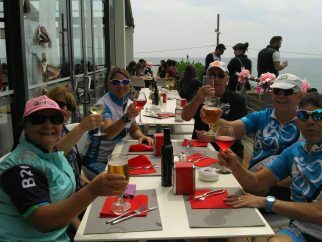 Our Giro Bike Tour in Italy was absolutely fabulous. First class all the way. Bridget and Paul were amazing hosts. 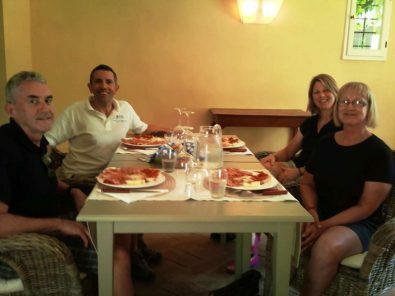 The quality of accommodation, food, day excursions (magnificent wine tasting), cycling, (everything) and care they gave us was fantastic. We would highly recommend Practice Bicycle Tours to any customers that wish to experience an amazing cycling holiday with their partners. They would have to be the best in the business and know their stuff. I can’t speak highly enough about how professional they are and how precisely they can tailor to the specific needs of their guests. Below is the unique Giro 2019 itinerary! Don’t miss out join us above. Arrival Day in Italy and the Republic of San Marino, one of the smallest and oldest independent states in Europe along with the Vatican City and Monaco. Welcome to your unique Giro d’Italia 2019 with Practice Bicycle Tours and the start of your action packed dream bike tour escape overlooking the Apennines Mountains and the Adriatic Coast of Italy! Once transferred to your Hotel, relax and unwind should time permit we can take a short ride in this special part of Italy. This evening relax and enjoy an Aperitivo as we officially welcome you to the Giro d’Italia, followed by classic Italian dinner, finished in true Italian style with a Gelato and Grappa! This is your unique Giro 2019 bike tour experience and the first live viewing opportunity with stage 8 on the testing undulating roads to the finish line on the coast at Pesaro. Pesaro was the birth place of the great composer Gioacchino Rossini which the Giro dedicates the stage to. With a week of racing in the legs of the Giro peloton and this long 235km stage anything can happen at the Giro and it often does. Add in a technical final 60km including 3 GPM’s and the atmosphere will be electric. 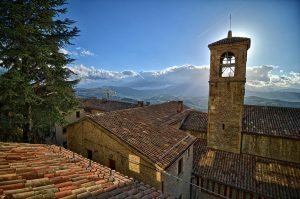 San Marino is wonderfully situated on the slopes of Mount Titano a great location for your Giro 2019 bike tour, the Giro is more than climbing mountains every day in the temperamental weather of the Dolomite’s. The unique variety of riding and race viewing offered from Practice Bicycle comes from the skill set developed over 20 years of spectacular cycling and bike racing. 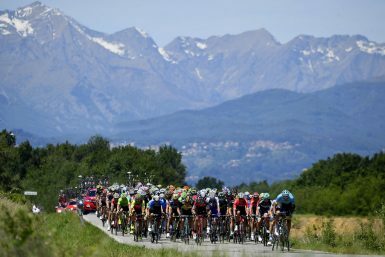 Choose your perfect bike ride as we join the race action live from the roadside amongst this wonderful region, the first of our thrilling opportunities to see the best professional cyclists in the world at this years Giro d’Italia with the tifosi fans of cycling! The Giro d’Italia contenders face the race of truth today at this year’s Giro with the San Marino Mountain Time Trial stage where every second counts! We can feel the atmosphere of this epic 34.7km course with your unique ride this morning on the race route before all the action begins. This stage is also the Wine Stage, dedicated to the Sangiovese wine; we can also celebrate with a fine glass of Sangiovese di Romagna. This time trial route will push the professionals to their limit with the second half of this TT all uphill and the finish line on the narrow streets of San Marino. What could be a more perfect day for all fans of world cycling with your ‘Unique Live Viewing Spot’ on the medieval streets of San Marino and all the excitement of the final push to the line and the eventual winner of the Maglia Rosa. Tonight feel more Italian than you thought possible with a traditional evening promenade and dinner of an Italian feast at your leisure. It’s a well-deserved rest day for the Giro d’Italia peloton the perfect opportunity for you to relax with a discovery ride of San Marino this UNESCO world heritage area as we explore the roads together of the Emilia-Romagna and Marche regions with great cycling. 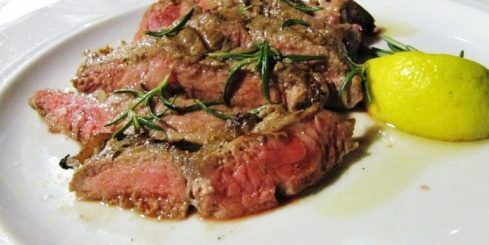 Enjoy a relaxing day with all that is unique about Italy and your bike tour vacation with Practice Bicycle, turn the pedals with no time constraints with an included leisurely break for lunch consisting of only the best flavours of Italy, unique to Italian village life. 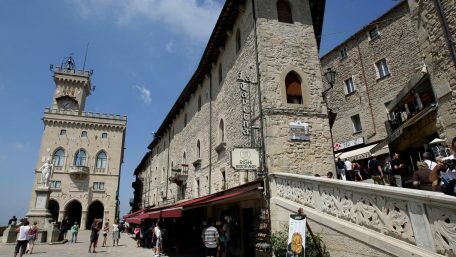 If you’re also in need of a rest day, enjoy San Marino and explore the historic labyrinth of streets and buildings. Take the time to sit and take in the priceless views and for those wishing to stretch the legs visit the Three Towers of San Marino located on the three peaks of Monte Titano. INCLUSIONS: Breakfast, Giro Farewell Dinner to remember! Experience for yourself why we all love Italian cycling and the Giro d’Italia with a visit to a stage start with all the flash and glitz of a fashion parade at one of the biggest bike races in the world! Whilst you wander amongst the stage start in Ravenna, look out for your favourite teams and cycling stars in a tranquil mood after yesterday’s rest day. 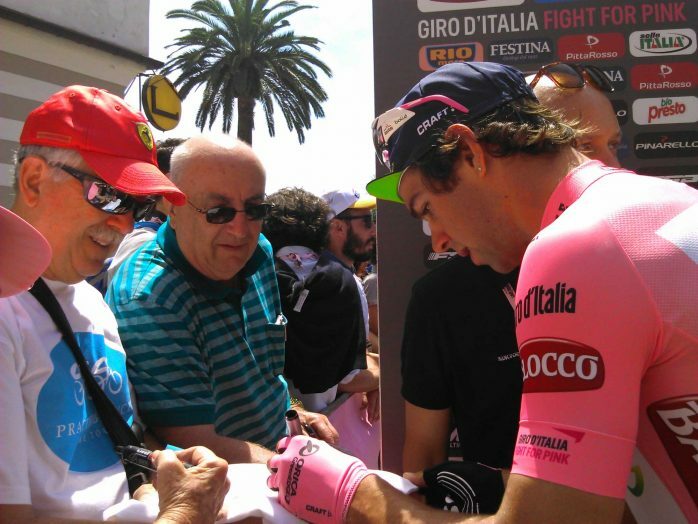 It’s a great opportunity for you to get that special memento picture of the Pink of the Giro! Enjoy as much time in the saddle as you wish today with your Adriatic coast ride route to Ravenna. This coastal area is one of the most popular destinations for the summer beach holidays in Italy, where row after row relax in true Italian style. 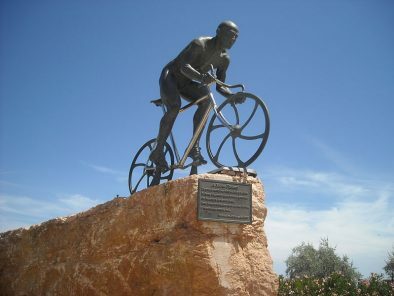 For historians of cycling racing the 1998 Giro and Tour de France winner Marco Pantani Memorial is on our ride route today, this prolific climber was a star of cycling and encouraged a generation to take up cycling. Like fine wine, the team at Practice Bicycle offer refined Bike Race Tours, only possible with all the experience of their own life of International racing an experience which today they enjoy sharing with you. Tonight join us to celebrate a unique Giro d’Italia 2019 experience together with that marvelous Italian institution Farewell Dinner. Departure Day and It’s unfortunately time for your Giro d’Italia 2019 to draw to an end and so must the dream as we transfer you to Bologna Airport this morning and your onward travels. Arrivederci’ from Practice Bicycle Bike Tours until the next time. Practice Bicycle choose hand picked quality 3* Hotel accommodation, this years unique location is in San Marino (RSM) for a great stay at the Giro d’Italia and everything you’ll love about Italy…including gelato. You may choose to wander the unique streets of San Marino, do some shopping or just sit at the cafe admiring the amazing views and watch Italian life pass you by. Spend your evening enjoying a great meal just like a local, ready for your next day full of race action and cycling adventures in Italy. Whether you have years of cycling experience or are just new to the bicycle, you will love cycling in Italy. As long as you love bike racing, this trip is for you! With a choice of cycling routes available each day, one will certainly be perfect for you. Our small group policy and skilled cycling professional guides make for the perfect ride…your ride. We love a challenge as much as we love cycling. The team at Practice Bicycle has a history in professional bike racing and coaching. Your host Bridget Evans spent several seasons racing professionally in Italy including participating in the Giro d’Italia Donna 1999 & 2001! The Giro doesn’t have to be about climbing in the snow everyday, so if it’s a challenge you are looking for, we can definitely find just the right rides for you. If you are looking for a challenge to your normal cycling or looking to improve with quality individual coaching advice, then consider our winter and summer training weeks. On each of our bike race tours we analyse each years race route before tailoring the daily guided rides with a choice of ride options available for different cycling abilities. The Practice Bicycle team have a unique skill set and a world of experience in developing great routes for riders of all levels with over 20 years cycling in Europe. To get an idea of what sort of rides you will be doing, have a look at the Itinerary. As a Giro d’Italia Non Cycling guest and bike race fan you experience all the spectacle, excitement and action up close and personal of this classic bike race live. 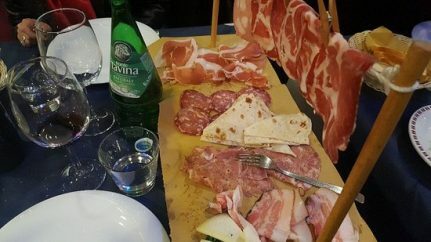 Our support team will share with you authentic Italy culture and villages on route whilst catching up with the cycling group at our ‘Unique live viewing spots’ and handpicked Giro restaurant lunch together. Why do you choose to watch 3 stages at the Giro d'Italia bike race tour? Our specialty bike race tours are designed to give our guests an unique insight into the world of bike racing, which includes viewing the Giro d’Italia race on 3 stages. We believe that this is the perfect mix for your enjoyment of viewing the race action live, contrasting with your own variety of personally tailored guided rides and the opportunity of enough time to relax and experience your idyllic Italian location. Daily ride options – ideal for how much you wish to ride! 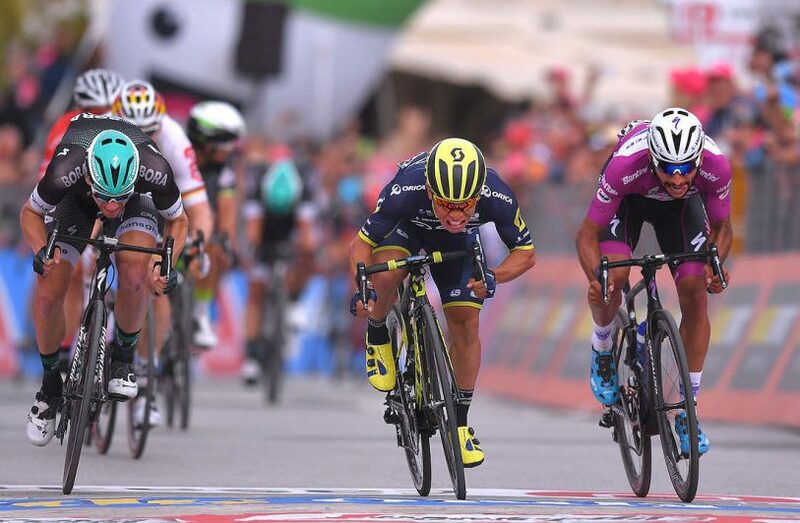 Giro live attacking action at its best to the finish line at Pesaro, birth place of the great composer Gioacchino Rossini.